Media Player Classic Home Cinema (MPC-HC) is a light-weight media player for Windows. It looks just like Windows Media Player v6.4, but has many additional features. You can use the player as a Media Player Classic Home Theater. MPC-HC has gotten a great number of users and fans, no matter they are on Windows 7, Windows 8, or updated to Windows 10, Media Player Classic is one of their choices to download to play video and audio files. Here is the Review of Media Player Classic Home Cinema. ☆ 64 bit media player with wide media codec support including MKV, AVI, MP4, MP3, AAC, etc. Added additional video decoders, H.264, VC-1 and MPEG-2 with DirectX Video Acceleration support in particular. ☆ Play 4K/8K videos without installing codec like other 8K video players do. ☆ There's about a half dozen screens to step through in installation process. ☆ The player's interface is a little awkward. To open a file you don't get a standard browser window, but a list of recently opened files in drop-down format along with a Browse button that then offers an Explorer window. ☆ By default the player always opens with the sound turned off, and an icon has to be clicked to activate audio. ☆ The player crashed a few times on larger files. ☆ The Stop button resets to the beginning of the video instead of holding the current location like most players do. ☆ Navigation back and forth in a video file also seemed slower than some competing products. Some users confuse that why persons want to use Media Player Classic Home Cinema over other players on the market since there's just not enough there to make this software stand out. If you're still using MPC-HC, it's time to look for an alternative. The best media player can handle a huge variety of audio and video formats, without the need to download additional codecs for the more esoteric file types you sometimes encounter online. 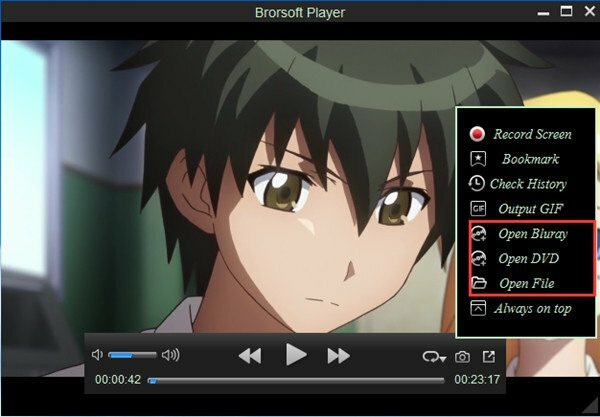 Here the best Media Player Classic Home Cinema alternative for Windows 10-Brorsoft 8K Video Player (Mac version) is highly recommended here. Overall, it not only can smoothly play common videos like MP4, MTS, MXF, MOV, MKV, AVI, H.265 .ect with 4K or 8K resolution, but also can support region Blu-ray/DVD/ISO files. Meanwhile, it offers some additional features besides playback function such as making gif, adding bookmark, recording video screen, taking snapshot, looping video, and so on. Download and run the software; click "Playback" button to choose videos you wanna play. Brorsoft 8K Video Player is more than a video and music player for Windows 10 or macOS High Sierra, it also works as a video editing tool. It shoud be considered as the best Media Player Classic Home Cinema alternative for both Mac and Windows.